Many developers name 2 way binding as the main advantage of Angular.js framework. So what 2 way binding actually is and how it helps Angular.js framework to deliver better experience? The below images explain the difference quite well. In MVC (model, view & controller) world 1 way data binding happens when controller generates view by merging model and view template. This process happens once and generated view is then sent to the client application. Once client application receives rendered view there is no easy way to automatically update this view if model data changes. View is only regenerated once user refreshes the the app screen / page with current view. Or navigates to another application page. 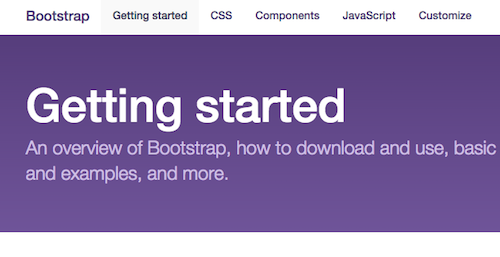 The Bootstrap Framework Controversy … Should You Use It or Not? Released back in 2011, Twitter’s Bootstrap framework is one of the most popular – if not the most popular – front-end website development framework out there, at least in 2015. And not without a reason. Bootstrap provides a really easy to grasp way of crafting your site designs and thus allows you to create great looking and mobile-optimized builds in hours, instead of days. That being said, there’s a lot of conflicting opinions around Bootstrap with almost equal number of people on both sides of the barricade. Some experienced developers (like the guys over at ThemeShaper, for example) have addressed various issues with the framework and pointed out why it might not be the perfect web development solution after all. So today, let’s look into some of the framework’s known traits, both in terms of the positives as well as the negatives. However, I’ll try not to sway your opinion in any direction by telling you what I consider the right solution here – in terms of using Bootstrap or not – but instead, I just want to provide enough insight for you to be able to make your own decision. We are starting the series of tutorials and short reviews about popular HTML5 mobile frameworks. In this post, we are discussing why would developers use existing mobile web framework instead of building one from the ground up. And we are creating simple, mobile web application with Framework7. In the second tutorial part we use Parse.com cloud service to integrate user login. The third part is about wrapping Framework7 application into PgoneGap. Mobile web applications allow us to quickly design and develop prototypes, reuse already written code across multiple mobile platforms and in many cases match look & feel for customers using wide range of devices with different operating systems. I haven’t had the best relationship with the issue of site speed over the years, if I’m honest. I mean, even though I knew that it’s obviously important, I wasn’t doing much testing to find out how fast my site was for its actual audiences. After all, the site loaded just fine for me (when doing administrative tasks, publishing content and so on), so it’s probably the same for my audience too, right? Well, not quite. As it turned out, the average visitor had to wait around eight seconds (that’s 8) for my site to load. I was quite shocked to see that number, and that’s probably why I remember it so clearly. Happy new year to all HTMLCenter readers! HTMLCenter blog meets this year with completely refreshed look & feel and new monthly Newsletter (we will give our best to make ‘monthly’ – regular). In addition to this we have made few other minor changes to overall blog structure. How and why we did it all? Site look & feel redesign project was sitting on my to-do list for a while, but somehow it managed skip down in priority order each month. HTMLCenter runs on WordPress (very good CMS indeed), and the old custom theme we had was becoming much outdated. Old WordPress theme was build with desktop Internet browser in mind and didn’t look good on mobile device browsers at all. Increasing number of HTMLCenter readers arriving via smart devices was a constant reminder that we had to find the time and do blog redesign.